Anesthetic alterations of collective terahertz oscillations in tubulin correlate with clinical potency: Implications for anesthetic action and post-operative cognitive dysfunction Craddock TJA, Kurian P, Preto J, Sahu K, Hameroff SR, Klobukowski M, Tuszynski JA. Multi-scale hierarchy with dipole oscillations from neuron (left) downward in size and upward in frequency through microtubule, rows of tubulin, tubulin and London force dipole networks which oscillate in the terahertz regime. Anesthetics may act (lower right) by altering these collective dipole oscillations. Newswise — Most view consciousness as an emergent property of complex computation mediated by membrane and synaptic processes among brain neurons. But despite ever-increasing detailed knowledge, the brain-as-computer approach has failed to shed light on the nature of consciousness. Accordingly, some now see the brain as a multi-scale hierarchy, resonating inside neurons with deeper, faster (quantum) vibrations in cytoskeletal microtubules, much more like an orchestra than a computer. In the 19th century a group of gases with diverse chemical structures were found to have a common action. When inhaled, the gases rendered humans and animals immobile, unresponsive and presumably unconscious. When the ‘anesthetic’ gas was exhaled away, the subjects ‘woke up’ and regained consciousness. For each gas, the same concentration was required to anesthetize all types of animals - salamanders, fruit flies, horses, mice and humans, the effective dosage for each gas becoming known as its ‘minimum alveolar concentration’ (‘MAC’), inversely proportional to potency. Anesthetic gases are believed to be stabilized at their targets by weak, quantum interactions known as van der Waals London forces. How do such subtle forces exert profound and selective effects on consciousness? Seeking a unifying factor, Hans Meyer (1899) and Charles Overton (1901) discovered that anesthetic potency (1/MAC) correlated strongly with gas binding solubility in a non-polar, lipid-like medium akin to olive oil. The ‘Meyer-Overton correlation’ thus suggested anesthetics acted in, and consciousness arose from, non-polar, oil-like regions somewhere in the brain. These were initially taken to imply lipid regions of neuronal membranes, but in the 1980s Nick Franks and Bill Lieb at Imperial College, London, demonstrated that anesthetics acted instead inside proteins, in non-polar, ‘hydrophobic pockets’. These water-averse, oil-like regions (‘oil and water don’t mix!’) include ‘pi resonance’ electron clouds of aromatic amino acids tryptophan, tyrosine and phenylalanine. These electron clouds are conducive to the formation of networks of London force dipoles with characteristic oscillation frequencies. In the 1990s, a few ‘oddball’ gases were discovered which follow Meyer-Overton, i.e. bind in intra-protein pi resonance pockets, but do not cause anesthesia. These ‘non-anesthetics’ include trifluoromethylbenzene (TFMB) and dichlorohexafluorocyclobutane (F6). An explanation for anesthetic action should also explain inaction by these non-anesthetics. In which proteins do anesthetics bind and act to prevent consciousness? Post-synaptic membrane receptor and ion channel proteins for neurotransmitters GABAA, serotonin, acetylcholine and others were prime suspects for decades. But anesthetic effects upon them proved variable and inconsistent, and failed to follow any Meyer-Overton correlation. About 10 years ago, Rod Eckenhoff’s lab at the University of Pennsylvania began to systematically study anesthetic binding to all neuronal proteins. Through genomic, proteomic and optogenetic research, they found that anesthetic gases appear to exert their functional effects on cytoskeletal microtubules in neuronal interiors. This was significant because microtubules, cylindrical polymers of the protein tubulin, are disrupted in post-operative cognitive dysfunction (POCD) which sometimes follows repetitive anesthetic exposures. But how would weak dipole couplings in microtubules block consciousness? Experimental bio-nanotechnology by the group of Anirban Bandyopadhyay at National Institute of Material Sciences in Tsukuba, Japan has suggested self-similar resonances in microtubules, repeating in terahertz, gigahertz, megahertz and kilohertz frequency ranges. Some have proposed consciousness derives from such microtubule vibrations, part of a multi-level hierarchy scaling up to hertz and EEG (Craddock et al 2015, Hameroff and Penrose 2014, Hameroff et al 2002). Previously, Craddock et al (2015) modeled two pi resonance clouds whose dipoles couple and oscillate in the terahertz regime, and showed that simulated presence of a nearby anesthetic gas molecule (halothane) significantly dampened the oscillation frequency. In the present study, an interdisciplinary team led by Travis Craddock from Nova Southeastern University in Ft. Lauderdale, Florida, and with collaborators from Howard University (Washington, DC), University of Alberta and University of Arizona, used computer modeling of van der Waals-type interactions to simulate collective induced-dipole oscillations (Kurian et al, 2016) of all 86 aromatic amino acids in tubulin, the component protein of microtubules, and found a spectrum of terahertz oscillation frequencies. Re-simulation of the collective dipole oscillations with each of 8 anesthetic gases displayed a prominent downward frequency shift at around 613 terahertz (in the visible blue spectrum, but existing internally to the system without photoexcitation). The authors then did the same with 2 non-anesthetic gases (TFMB and F6). They found that all 8 anesthetics shifted the frequency slower by an amount proportional to their anesthetic potency (1/MAC), and that non-anesthetics TFMB and F6 had a slightly upward nudge on the 613 terahertz oscillations. Change in tubulin collective dipole modes due to the addition of anesthetic and non-anesthetic molecules, with maximum agent-induced change in tubulin normal-mode oscillation frequency at (613 ± 8) THz plotted versus each molecule’s minimum alveolar concentration (MAC). Blue:Anesthetic, Green;Anesthetic/convulsant, Pink:Non-anesthetic, - Meth:Methoxyflurane, Halo:Halothane, Iso:Isoflurane, En:Enflurane, DEth: Diethyl ether, Sevo:Sevoflurane, Flur:Flurothyl, Des:Desflurane, Nitr:Nitrous oxide, F6:dichlorohexafluorocyclobutane, TFMB: trifluoromethylbenzene). For anesthetic and non-anesthetic molecules, alterations in oscillation frequency correlate closely with their anesthetic potency (1/MAC). 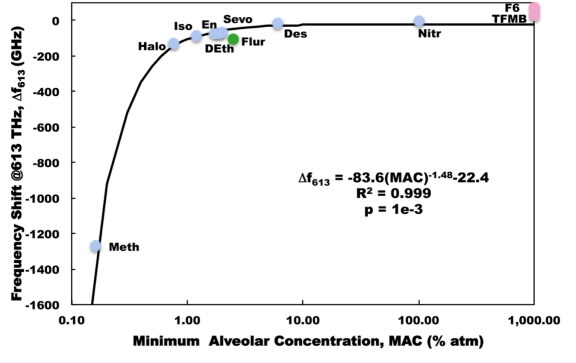 Non-anesthetics (shown with MAC of 1000%, 10 atmospheres) are predicted with their correct lack of potency, unlike with the Meyer-Overton correlation. Reproduced from Craddock et al., Sci. Rep., 2017. The results provide a marked improvement to the Meyer-Overton correlation by discriminating anesthetics from non-anesthetics, and suggest that anesthetics block consciousness by altering terahertz oscillations in tubulin. The conventional wisdom that anesthetics act on, and consciousness emerges from, neuronal membrane-based proteins is being revisited. 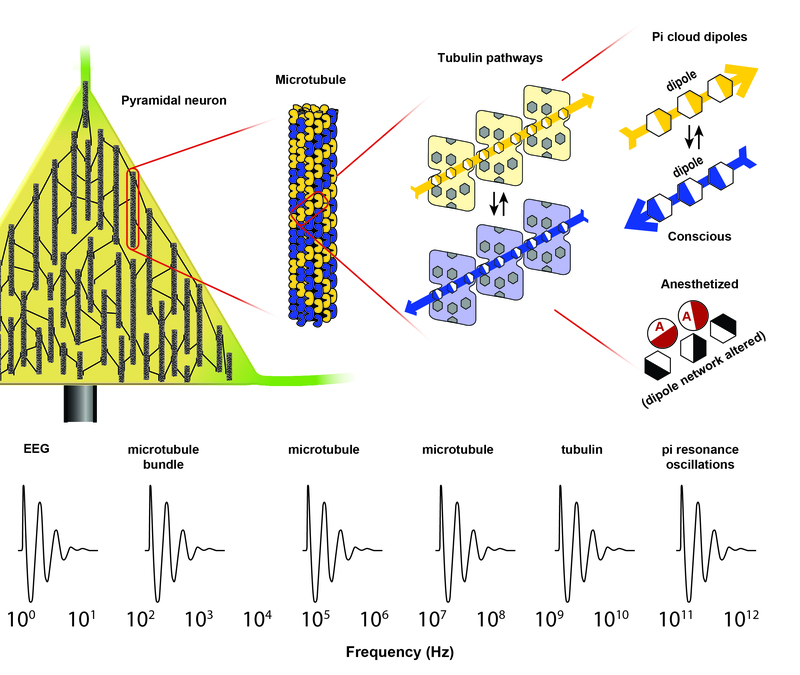 Evidence points to consciousness requiring a multi-scale hierarchy originating with collective terahertz oscillations in tubulin inside brain neurons. The findings also imply that rational design of future anesthetic and psychoactive drugs should take into consideration their effects on tubulin vibrations rather than solely on membrane protein actions. “Scientific luminaries from Erwin Schrödinger to Sir Roger Penrose have proposed that consciousness requires quantum coherent processes, but skeptics have asserted such processes would suffer ‘decoherence’ in the ‘warm, wet and noisy’ biological milieu. Our study supports growing evidence that non-polar, pi resonance regions in microtubules and other biomolecules maintain these coherent states, and that a ‘quantum underground’ pervades the brain’s neurons."